The Flare Heat Release helps relieve radiant heat created by the top of the fireplace. The heat collects in the fireplace chase, & through natural convection, rises up and out of the release opening. The Heat Release outlet for hot airflow from the wall enclosure MUST remain open. The outlet must be at top of enclosure not necessarily at the front, making certain minimum measurements are maintained. 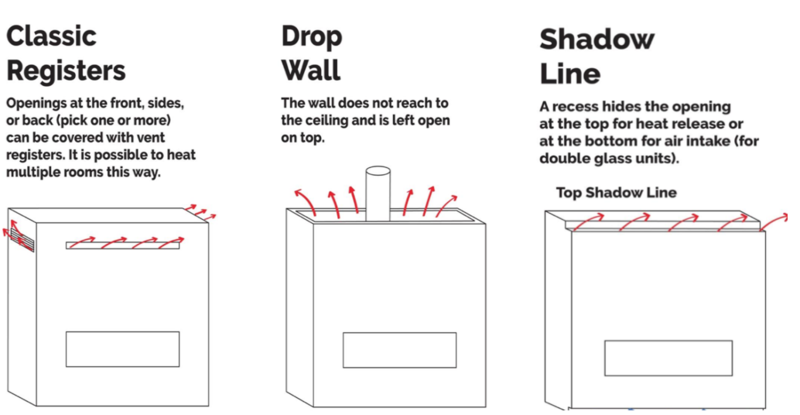 The opening can be installed at the sides of the enclosure (left & right of framing), back or on top of (in case of a drop wall or shadow line design). Depending on the unit size and BTU the heat can be up to 180 degrees Fahrenheit. For fireplaces sized 80”- 100″ / 200 cm – 250 cm – Vent area must be at least 200 square inches. For fireplaces sized 60”-70″ / 150 cm – 175 cm – Vent area must be at least 140 square inches. For fireplace sized 50” / 125 cm & SMALLER – Vent area must be at least 100 square inches. The Heat Release outlet(s) must be at least 1” (25mm) from the ceiling, and no more than 3” (76mm) down. Install the vent on top of the enclosure with a drop wall or shadow line (a chase that is not built all the way to the upper ceiling). Preventing you from placing a heat register in the middle of the finishing material. Any Heat Release opening greater than the minimum size is highly recommended and will help reduce the temperature of the surrounding walls.